This is the 3rd blog of our four part series on cloud server user management. Here’s a list of the others. There are four core problems with this collective group of solutions. It is critical for organizations to have only one source of truth for users on the network. As you can imagine, multiple directories or manual cloud computing user management can easily cause conflicts or disagreements in data. Manifestations of problems in this category can be catastrophic. Imagine what could happen if a terminated employee still had access to critical servers because there wasn’t an in-sync directory service mapping of users to server access. Security could be breached instantaneously. What’s more, security of data inherently becomes more complex as companies grow. While maintaining multiple disparate directories is never a good idea, the practice has been driven by very real, and in some cases, seemingly insurmountable technical issues. By default, LDAP does not share the same schema as Microsoft Active Directory®. Therefore, extra efforts must be made to have Windows, Mac, or Linux clients authenticate against OpenLDAP™. Making one directory drive an entire organization is not a trivial task, so many organizations opt for two directories, one AD (usually the primary directory, because of its superior management UI) to cover the Windows systems, and a slave LDAP server to cover everything else. While not impossible, it’s an added task that most organizations moving to the cloud would rather avoid. A number of the approaches listed above also have inherent reliability issues. First of all, manually managing user access is subject to human error. Did every person get the access that they needed or did they get too much access? Was the user’s name typed in properly? Or was there a typo? Creating additional directory servers in the cloud also starts an additional chain of work. 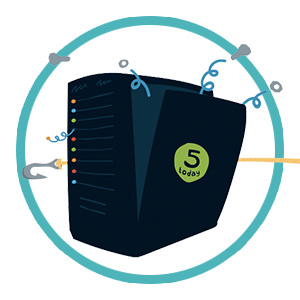 Directory servers need to be highly available because any downtime can mean your users can’t do their work. Finally, exposing your directory server to the Internet can invite attacks or cause it to be subject to Internet connectivity issues between your cloud servers and your directory store. You’ll need to address those issues either through load balancing or increased capacity. Traditional solutions to server directory services problems are expensive for organizations, whether it is from a monetary standpoint or a time and resources perspective. Either way you cut it, managing users across your organization is often not a core competency. It needs to be done well and securely, but the costs of having resources focus on this task versus core tasks can be expensive. The sixth solution we have discussed is Directory-as-a-Service®. JumpCloud’s DaaS solution is focused on solving these specific issues. By extending your internal AD/LDAP directory to JumpCloud®, you continue to have one user store of record. As a cloud-based directory service, the networking is effectively taken care of for you, thereby simplifying the complex management issues and reducing human errors. To get started, businesses need to simply point their server to authenticate with our LDAP server or install the agent. Both methods (authentication with our LDAP server or an installed agent) are highly secure and reliable with multiple levels of redundancy. As a SaaS-based service, customers get to off-load the software, hardware, and management costs to JumpCloud creating a more cost-effective cloud computing solution. JumpCloud’s cloud-based directory service covers a lot of ground for organizations. It’s an Identity-as-a-Service platform that centralizes user management, is a virtual LDAP server, True Single Sign-On™ provider, RADIUS-as-a-Service infrastructure, 2FA add-on (for Windows, Mac, and Linux), device management tool, and more. If you have questions or comments on how to solve for the critical challenges of extending your user directory to cloud servers, drop us a line or give us a call.